If the name Franz Schreker has you reaching for the reference books, then searching for references to Christophorus will leave you delving deep into their pages. Schreker receives scant coverage in my references of choice (Grove dictionary and the New Penguin Opera Guide), so it is just as well that the supporting booklet to this recording is as fully informed as it is. There are a great number of personal associations that Schreker drew upon to influence his own compositional output. These include teacher, Robert Fuchs, Richard Strauss, Schoenberg, Zemlinsky, Mahler and Pfitzner. Despite this he decidedly remains his own man. In describing Schreker to someone recently I found their assumption was that he has a mix of neo-Hindemith and Pfitzner � earnest, dry and perhaps at times dull. But this for the most part is not the case: across his work, one might also draw parallels with Wagner�s opulence, Wolf�s chromaticism, a Brahmsian folk-style, or even Fauré�s tonal palette. Indeed, considering his lieder for a moment, it will come as no surprise that he shared the concerns of his era that prompted many of his contemporaries to set the same texts as he did. An excellent cross-section of his song output can be found on Arte Nova (74321 72126 2). Operatically however, few of his works have reached wide-spread attention outside Germany, where for many years his reputation suffered as a result of the Nazi�s branding him a �degenerate�. Clearly this recording, typical of the CPO label, is aimed at redressing the balance. 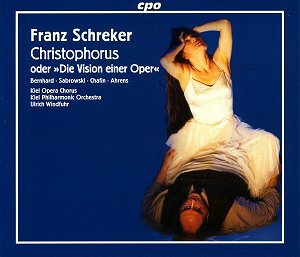 It completes a trio of Schreker opera releases drawn from live performances in 2002/2003 at the Kiel Opera under Ulrich Windfuhr. Marco Polo have also released operas by Schreker: Der Ferne Klang (8.223270-271) and Flammen (8.223422) � not to be confused with Schulhoff�s work of the same name. Christophorus, or "the vision of an opera" � the sub-title is significant, and gives perhaps the easiest �way in� to the work, whose subject is a composer writing an opera. At a deeper level is the concern of artist as man (or vice versa), hypersensitivity about his condition, the degeneration of artists and artistry and �Germanity� in modern music: all familiar concerns of the period. There is a temptation to see the work as autobiographical, which to a certain extent it might be, but the composer Anselm�s world view is more strongly formed by Nietzsche and Thomas Mann than by things that can be directly taken from Schreker. As to the performance, firstly you should realize this is no ordinary opera � a point the composer himself reinforced in his foreword. With bells prefacing the foreword and interspersing the two acts, a quasi-liturgical feel is achieved. Windfuhr keeps things moving generally speaking, and indeed shows remarkable affinity with the idiom of the work. After repeated listening, I came to wish for greater presence in a few of the lead roles, though all � particularly Sabrowski and Chafin � are well taken. It sounds like an involving evening at the opera was had by all. Would I return to Schreker�s work quickly? The lieder, yes; the operas less so. As Beecham once remarked after conducting Elektra � the superb performance with Erna Schluter and Ljuba Welitsch in London 1947 (Myto 981.H004),"All I want to hear is Mozart for a month!" Although from weightier times, the Schreker idiom eventually becomes oppressive, and not a little tedious � facts this performance cannot quite hide. I must have listened to the whole thing ten times to fully get my ears round it � this is resolutely a work for those wishing to sign up to Schreker�s cause, or plumb the already well explored depths of German composition in the early 1930s.